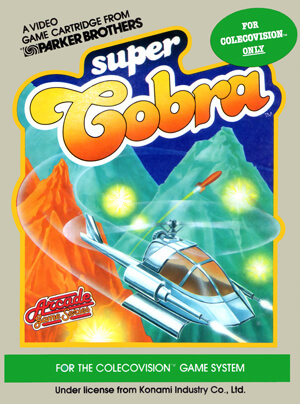 Super Cobra is a side-scrolling shooter based on the arcade game. 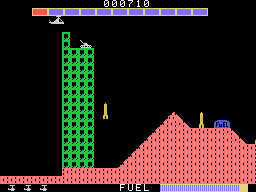 You're a chopper pilot on a surveillance mission in enemy territory; your goal is to make it through the various obstacle courses alive and score as many points as possible. 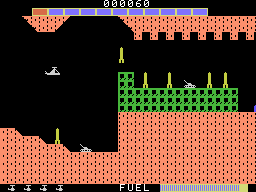 Tall buildings, mountains, narrow tunnels, and various enemies (such as tanks, rockets, mines, and more) can all get in the way and destroy your chopper if you aren't careful. 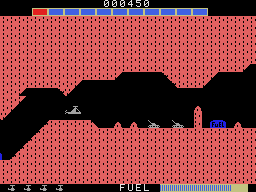 To help defend yourself, the chopper is armed with a machine gun and bombs which can be used to destroy the enemy tanks and rockets. 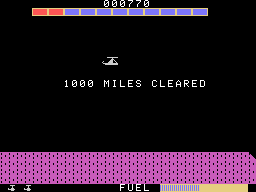 To make the task more difficult, your chopper has a limited amount of fuel. 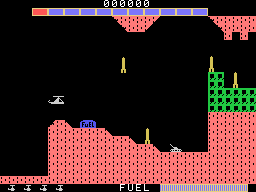 Throughout the landscapes are fuel tanks; if one of these is shot or bombed, you will be awarded extra fuel. 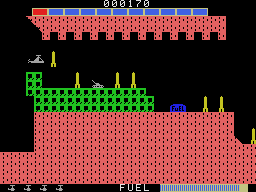 As the levels progress, the enemies become more aggressive, fuel becomes more scarce, and the landscape becomes trickier to navigate.